Yoga is the serene practice of gaining flexibility through movement. Working on mind and body, you take a meditative approach to aligning your spiritual and mental beliefs. Focusing on balance, yoga creates a sense of peace and inner stability. Taking your powerful routine to the water can elevate you to the next level by choosing the best sups for yoga. Paddle boards have advanced a lot in the last few years to the point of being able to perform poses on the board. The boards on the list are thick enough to do even advanced moves without getting wet. When looking for the paddle boards for yoga remember that balance is key. A wide stance and exceptional stability is something that every board designed for yoga should offer. ISLE is a company with years of experience making and perfecting paddle boards. They use nothing but the finest materials and manufacturing practices to create a high quality product. This experience has translated into one of the best SUP boards for yoga use. Made using military-grade PVC, the ISLE Airtech is an incredibly durable board. Inflating to 6 inches allows riders to perform yoga poses without getting wet. The large 32 inch width allows you to have stability on the water to move around and find your rhythm. A bungee system will safely secure all of your belongings, such as a yoga mat, so that you can find a perfect secluded beach to find your inner peace. The package comes with everything you need to be water ready including a three piece paddle, backpack, pump, and repair kit. This company is one of the leading brands for paddle boards on the market, that’s why we featured them twice here. The ISLE Versa Epoxy, like most of their designs, excels in the SUP world. Confident in their product they go as far as to offer a 30 day money back guarantee. This board is made of high quality material meaning it will last you multiple seasons before showing signs of wear. Even the included paddle is made out of carbon and nylon instead of the cheaper plastic material. Like the rest of the boards on our list this boards large width creates a stable board with loads of square footage for you to perform all of your yoga maneuvers. Coupled with a decent carrying capacity and high quality add ons such as the paddle and backpack this is a perfect package for any skill level rider. This is an extremely light paddleboard. When the board is inflated it weighs in at only 18 pounds. This is great for carrying it from your vehicle to the water, but the backpack gives you so much more options than that. The board and accessories will compact enough to fit in the nifty carry backpack. When everything is in, the bag will only weight in at 29 pounds. This is perfect for taking your board anywhere. You can get this kit on a plane with no problems, allowing you to take your yoga board with you anywhere. The drop-stitching and the marine-grade PVC make this a durable paddleboard. The soft EVA deck pad also makes great for your yoga. The deck is firm and rigid while remaining soft. This is a great paddleboard for yoga on any body of water. We love many things about this yoga paddleboard, but the thing we love the most has to be the backpack with wheels. Having a bag for your inflatable paddleboard is essential, but one with wheels is a welcome addition. Now, you can pull the bag behind you when you have the means to do so and put the bag on your back when the terrain gets rough. This board also supports a lot of weight. 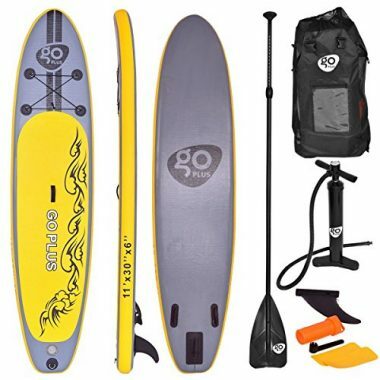 Combine this with the fact that the board handles well, and you have a paddleboard which you can use for long trips. Load up your stuff in the bungee cords, or use the d-rings, and you can be out on the water all day, stopping here and there for yoga sessions. This is one of the widest boards on our list, so if you are looking for something which has a lot of space, and which can carry a lot of weight, then this is the board for you. There is a large EVA footpad on this board. The 4mm of thickness help to make this one of the best boards for traction when you are out on the water. The honeycomb groove pattern has been heat-embossed to give the best grip. The board also has a curved design to offer extra stability when you are in the water. This is a great board for beginners. The combination of stability and traction makes this a great board to learn on. The included d-rings offer you more on customization. You can add extras to your board with ease, and you can also use the d-rings for extra storage. Ten Toes is a paddleboard company that makes the shopping experience a breeze. This company truly cares about their customers and will answer any questions you have. They have boards that are designed for everyone including our favorite, a yoga board. The Weekender is a 10 foot board that is a bit on the heavy side, but is a top contender when it comes to yoga stand up paddle boards. It’s 30 inch diameter will make even novice paddle boarders comfortable and feel stable in the water. With enough room to move around your board, this will allow you to take your yoga even farther. The board also comes equipped with a non-slip deck pad that will create a great space for you to practice your routine. The board is designed with drop stitch technology which means that when fully inflated it will ride and feel like a rigid board. 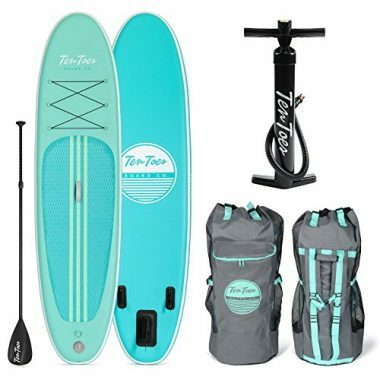 This means that you get an incredibly sturdy design including all the benefits of a hard paddle board with the unparalleled portability of an inflatable board. It’s made of military grade PVC which means this board is virtually indestructible. When all this is combined with a package that includes a paddle, pump, and repair kit you are getting excellent bang for your buck. This board is lighter than most of the competitors on the market. The great thing about this board is that the lightness of the board does not get in the way of the rigidity and stability. 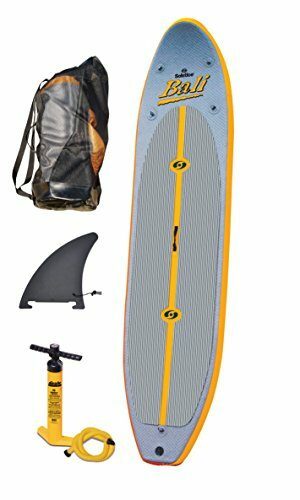 The high-pressure pump ensures that you get this board inflated to 15 psi, while the bungee system on the front of the board gives you a place to store your belongings. We love the lightweight aluminum paddle. The three-piece paddle is adjustable to give you the length you need when you are out on the water. The fin system can also be changed without the need for any tools. Simply take one fin off and add another one on. The addition of 15 d-rings also gives you options for tying anything down or adding any optional extras, such as a seat. This board is constructed from high-quality PVC, and the drop-stitching ensures that the board has great durability. 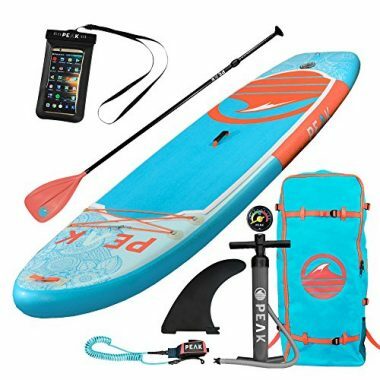 We like that this board is great for yoga practitioners and paddleboarders of all levels. The board is maneuverable enough to track easily through oceans, lakes, and rivers, while large enough for yoga. The fact that it can hold up to 440 pounds means that you can load it up with as much stuff as you want. The board also folds up very small, and the accessories and board will all fit into the included backpack, making it easy to store, transport, and carry. Getting their big start on TVs Shark Tank this company has the experience and passion behind them for designing their product. Our confidence in this company further soars with their willingness to add on a two year manufacturer’s warranty to sweeten the deal on this already killer buy. With military grade PVC construction this board is incredibly durable ensuring no cuffs or dings allow this board to look weathered before its time. 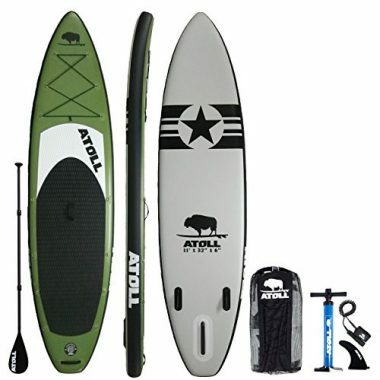 This board is one of our favorites as it has an incredibly high buoyancy rating, the highest on our list. This will allow your board to feel like its gliding atop the water and provide added stability for your sup board yoga practice. Weight limit: 350 lbs. This board can hold a lot of weight! A lot of inflatable SUPs will have lower weight limits. This Colorado company specializes in outdoor water sports, specifically kiteboarding and paddleboarding. They know this business well and boast an impressive lineup of boards. We couldn’t help but add this incredibly affordable board to our list of top SUPs. This board excels in durability as it is has a rigid design making it a sleek option for gliding across a calm lake. An incredibly strong design ensures this board can take the added pressures of incorporating a yoga practice. 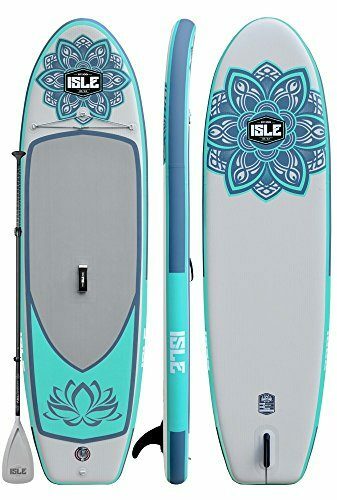 The most affordable yoga SUP on our list, this board is great for beginners or those who are money conscious but looking for a fun form of exercise and a way to improve their yoga practice. It is important that you buy a board that can perform in all the ways that you need it to. Yoga boards are typically wider and therefore sturdier than boards you use for long distance paddles. When choosing the best SUP boards for yoga consider your experience level and lifestyle before deciding on a board. We love inflatable boards for their compact design and their portability. We also recommend opting for a midline board which is an all around good-at-everything board. This will allow you the most versatility to do just about anything with your SUP, except for racing. 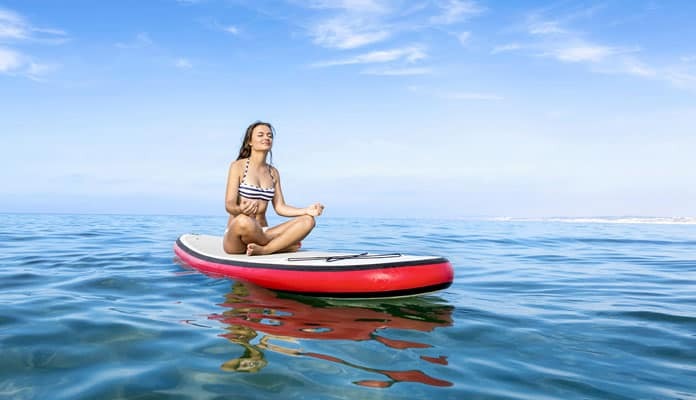 Why do yoga on a paddleboard? Yoga is an incredibly healthy and life changing practice. Whether you are new to yoga or have been practicing for years it is easy to see why this meditative stretching is so good for your health. Bringing your yoga practice onto your SUP may seem difficult but the rewards are unparalleled. It may start out as a challenge to feel comfortable not only standing but moving around on your board but once you can wrap your head around the idea of standing on water, it becomes much easier to clear your mind. We love the freedom to be in the middle of a lake with much less distraction performing our stand up paddle board yoga routine. This will allow you to gain even more from your meditative state. For the body, sup yoga will take your ordinary moves to the next level. Paddle boarding on its own is a great way to achieve a whole body workout. When doing yoga on your SUP you are sure to feel it in your core. Adding in the need to balance throughout every pose you will undoubtedly get a much better without than ever before. For the soul, there is something so peaceful about being on the water. Whether you choose to incorporate meditation into your yoga practice or not, you are guaranteed to feel relaxed and rejuvenated after a day spent out on the water. You can’t help but have a connection with nature as you find yourself gliding through the water to the sounds birds around you. So which board is right for me? We looked for boards specifically designed for yoga. All of the boards on our list have the basics to make up a great board with an additional factor of increased stability and a larger thickness to keep your from getting wet. When looking for a SUP it is important to know terminology and features of the best inflatable stand up paddle board. Being able to understand how these details will affect your ride will help you determine which board is right for you. We have put together a list of everything you need to know. There are two types of hulls, and both will work for SUP yoga. Planing hulls are built for stability. This is perfect for yoga out on the water. If you are new to SUP yoga, then we would recommend starting out with this type of hull on your board. Displacement hulls are more about speed, at the expense of stability. If you are more experienced at yoga, and you have good balance, then this hull will be fine. A displacement hull will also get you places quicker, and you can use the board for more than just yoga. Obviously, you want a board which can hold your weight. You also want to think about any additional weight on the board. If you are going out with yourself and nothing else, then you will be fine, but if you have a yoga mat, a picnic lunch, a book, or any other paddleboard accessories, then you need to take into account the extra weight and add that. We would also recommend adding at least 20% to your total weight before choosing your board. When you are doing yoga, the board can shift in ways it is not used to. The extra weight capacity will give you the extra stability that you will need. You do not want to skimp on the size when it comes to your paddleboard. If you get a shorter paddleboard, you can get around in the water quicker and make sharper turns, but that is not what we are looking for here. A longer board may be slower, but it will give youth space you need to do yoga. A good compromise is a board around 10-11 feet in length. This gives you enough room to lie to flat on your board, and also enough room to move about when you are on your feet. This length will still give you good maneuverability when you are out on the water. Your material will depend on the type of SUP. Solid SUPs have a foam core. We always recommend investing in high-quality materials, and with the foam, you should also be looking for foam which is waterproof. Look for durable materials on the top of your board, and material which is comfortable. You are going to be spending a lot of time on your board. For an inflatable SUP, we recommend looking at heavy-duty PVC, especially marine-grade PVC. Again, you should be looking at the comfort of the materials too. We have already talked about the length of your board, but let’s look at the thickness and width. The thickness is important with inflatable boards, and we would recommend at least five inches, if not six. This will give you good stability, and allow you to really fill the board with air. When it comes to the width, you need a board which is wide. Most YSUPs have wider boards than standard SUPs. You need this extra width for stability and also to give you the space to move around and stretch out. When we talk about the quality of the product, we are often talking about the price. Everyone wants a top-quality yoga paddleboard, but they do not want to have to pay for it. We always recommend paying a little extra to ensure that you have a quality board. From experience, we know that spending a little more money on your initial purchase, will save you a lot more money in the long-run. A good quality board will last longer and will do what you need it to do. You will not have to worry about replacing parts, or replacing the board altogether. A high-quality board will allow you to do the best yoga possible, and get the most out of your trip to the water. When you are buying your paddleboard, it is always nice togged some extras in the deal. With a YSUP, there are some extras which you can look for. It is always a benefit to have your board come with a paddle, instead of having to buy a paddle. You should also look out for storage options. Some paddleboards will come with a bungee storage system for you to pack a dry bag securely. With an inflatable paddleboard, you also want to look for an included pump. We like to look for a lot of grip on the pad of the paddleboard so that we get the best grip on our feet and hands when we are moving about. With an inflatable paddleboard, you want a board which can fold down small, but you also want a board which can be transported with ease. Take a look at the system that the board uses for transport. Some inflatable paddleboards have bags which double as dry bags when the paddleboard is not inside. We like to look for a bag which will not have to be left behind when you get on the water. Q: What Is SUP Yoga? A: SUP stands for stand-up paddleboard, and yoga is, well, yoga. SUP yoga is the practice of doing yoga while out on a paddleboard. As you are out on the water, you need to have great balance (which can be learned), and a great paddleboard (which can be bought). 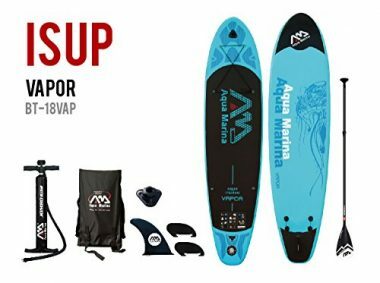 A YSUP paddleboard is a paddleboard which has been specially created to give you more stability than a regular paddleboard and allows you to move about easier when you are on the water. Q: Why Do Yoga On A Paddleboard? A: The question is, why not? Yoga is great for you, and paddleboarding is great for you, so why not combine the two to get the most out of the two activities. One reason why you should do yoga out in the middle of the water is the meditative aspect of it. When you are doing yoga, you try to choose surroundings which are conducive to relaxation. With yoga on a paddleboard, you are out in the middle of the water. What could be more relaxing than that? Q: What Do You Need To Enjoy Yoga On The Water? A: There are two things which you need: a good paddleboard and some experience with yoga. A YSUP is different from a regular paddleboard. The boards are built for yoga and to give more stability. This means that they handle differently to regular boards, and may not move through the water as easily. If you try to do yoga on a regular board, then you will be finding yourself in the water more often than not. You should also have some yoga experience. Yoga is hard enough, but when you are trying to do it on a moving platform, it becomes all the more difficult. If you are starting out with yoga, then we recommend learning on dry land before moving out into the water. A: The benefits to SUP yoga are numerous, just as the benefits of yoga are numerous. With any yoga, your flexibility is going to improve, you are going to lose weight, you are going to become stronger, you are getting a cardio workout, and you are meditating, all at the same time. SUP yoga is slightly different as you are on the water, but this only means that your body has to work slightly harder. With SUP yoga, you will find that your core is strengthened a lot more. 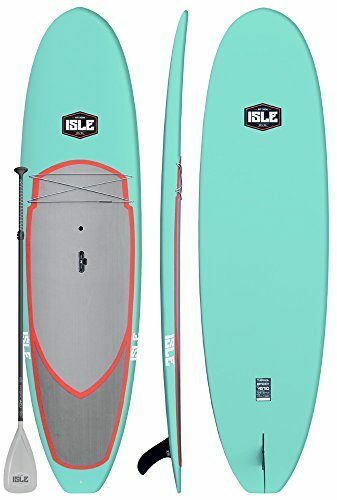 Q: Hard or Inflatable SUP Yoga Board? A: That choice is entirely up to you. A lot of it comes down to the feel of the board. With newer inflatable boards, you can almost not tell the difference. The main two things we think about are the firmness and the portability. An inflatable board may inflate to a high psi, but if the board still has some give, then you are not going to feel comfortable doing yoga. When it comes to portability, though, inflatable boards are the way to go. If you need to walk a long way from your vehicle to the water, then an inflatable board will make that walk a lot easier. Doing yoga on the water is not only a fun activity but the positive effects are sure to be felt long after you’ve left the water. An excellent form of exercise, this calming routine is an excellent cross training workout and will have your whole body feeling the routine in ways you couldn’t imagine. All of the boards on our list have features that make yoga not only possible, but enjoyable. Their wide stance and large footprint allow you move around and shift your weight without worrying about tipping or falling. These inflatable boards are designed to ride high in the water which is perfect for yoga as you will not get wet even in choppy water. No matter which board you choose you will have a capable board to practice yoga on. Love yoga? Love paddle boarding? Ever brought your practice to the water? Let us know how you like it in the comments below.